We are pleased to be utilizing the technology of portable monitoring in our practice for modalities involved with dental sleep medicine and treatment of TMJ disorders involving bruxism (teeth grinding). The term "home sleep testing" is often used for such monitoring, however, we must be clear that within the scope of a dental practice we have limitations as to how this device can actually be utilized. Our system is presently being used in two ways: (1)to determine the effectiveness of an oral appliance used in the treatment of obstructive sleep apnea (sleep-disordered breathing); and (2)to determine the level of sleep bruxism (tooth grinding) occuring during your sleep. Our portable monitoring system provides us information associated with snoring, sleep apnea events, oxygen saturation in the bloodstream, and muscle activity associated with teeth grinding. As you can see in the photo, the system is simple to wear in the comfort of your own bed. We feel this technology is critical to adequately assessing the effectiveness of our treatment protocols whether we are treating you with an oral appliance for obstructive sleep apnea or a TMJ/bruxism condition. Would you Like to Schedule a Sleep Study in Woodland Hills? 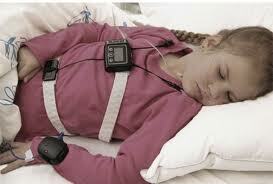 With our portable sleep monitoring system, your sleep study can be performed in the comfort of your own home. If you would like to discuss how to get started, contact us or schedule a consultation with Dan P. Hilton, D.D.S..